After defining your preferences in Part 1, now it’s time to identify the other information needed in managing your recipes in CALCMENU. You can manage the categories, keywords, sources, taxes, texts, units, yield units, nutrient rules, labor and ingredients. If you are managing your merchandise list (or ingredients list), I suggest you first create units, categories and suppliers. Identify which units you will use when creating new merchandise. Go to Configuration> Manage Units. CALCMENU has predefined units which you can already use. Just click the checkboxes of the units you want to use. It’s so easy! If there is a unit that you want to use but is not in the Unit List, you can quickly create a unit by clicking the Add button. Categories are terms to classify a group of merchandise, recipes or menus. To create categories, go to Configuration> Manage Categories> Merchandise (Recipe or Menu). You can create categories for merchandise groups (oils, pork, beef, poultry, vegetable, etc. ), for recipe collections (appetizers, cookie, meatloaf, salads, soups & stews, etc.) and for types of menus (À la carte, banquets, buffets, table d'hôte, etc.). You can create as many categories as you like. Categories can help you in searching and sorting your merchandise, recipes and menus. If you are creating a dessert menu for a party, you can easily filter your recipes using a category. Suppliers are the companies or people which provide you with your merchandise. This is where you buy your ingredients from. Go to Supplier> Supplier List. 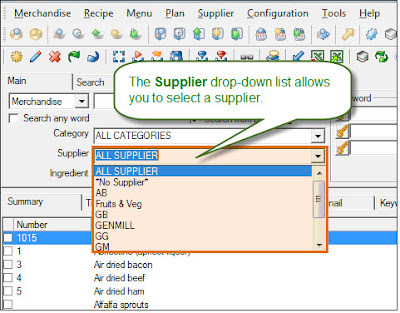 Create suppliers by clicking the Add a supplier button. You can provide all information about your supplier or just provide the required info: Reference name. Like the Categories, you can also use Suppliers in searching merchandise. Just select a supplier from the drop-down list and all merchandise from the selected supplier will be displayed in the search results. If you are managing the recipe list, you first need to create categories, sources, yield units and taxes. These are required information in creating a recipe. A source refers to the origin of a particular recipe. It can be a chef, a book, magazine, food service company, organization, website, etc. To create a source, go to Configuration> Manage Sources. Sources can help you in searching recipes. 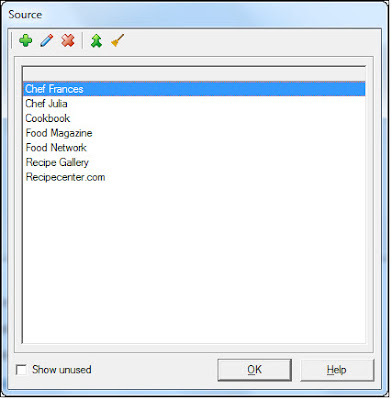 If you want to see which recipes came from a specific source, you can easily do so in CALCMENU. Just select a source from the drop-down list and viola! CALCMENU will automatically display recipes from that source. Yield UnitA yield unit is the number of servings a particular recipe makes. For example, a recipe for “Chicken parmesan” yields 8 servings. “Servings” is the yield unit of the recipe. To create a yield unit, go to Configuration> Manage Yield Units. CALCMENU made it easy for you since it has predefined yield units which are available when you create, modify and view a recipe. If you want to limit the yield units being displayed when you create, modify or view a recipe, just click the check boxes of the yield units which you want to be visible. Only these selected yield units will be displayed when selecting a recipe yield unit. If you want to use a yield unit that is not included in the list, click the Add button to start creating yield units. Government imposes tax. Whatever country you are in, there is tax. You shouldn’t forget assigning a tax rate on your merchandise or recipes. Go to Configuration> Manage Taxes. Create taxes by clicking the Add button. You can create several taxes like VAT or GST, sales tax and excise tax. Now that you have created all the essential information, you can now start with creating merchandise and recipes in CALCMENU.